MAN DISTRIBUTES 10,000 EARTHEN POTS FOR FREE AND HAS A UNUSUAL REASON BEHIND IT. As summer peaks to its highest temperature, with no mercy to its people. This man from Kerala with a thoughtful act has taken up a mission to distribute 10,000 pots to people who intend to provide water to birds in the summers. This good samaritan has been identified as Sreeman Narayanan, who is 70-years-old. He makes pots in Muppathadam village to ensure the well being of birds. He is also an award winning wholesale lottery dealer and lives life by Gandhian principles. According to Times Now, in his attempt to distribute 10,000 earthen pots, Narayanan has already distributed 9,000 pots. The project started by the 70-year-old is called 'Jeeva jalathinu oru manu pathram' which translates to 'an earthen pot for life saving water'. The project began first in 2018 and owing to its massive success, it was started again this year. Narayanan has been involved in various social projects under the name of 'Ente Gramam Gandhijiyilude' which means 'My village through the ways of Gandhiji'. A recent achievement of Narayanan was bagging the SK Pottekkat award for his contribution in saving the environment. No summer classes: Tamil Nadu bans classes during vacations! Kerala teen reveals why She Rode a Horse To Exam Hall and internet is Loving it! ‘ஈவிரக்கமின்றி துன்புறுத்தப்படும் கோயில் யானை’.. நெஞ்சை பிழியும் வீடியோ! ஆம்புலன்சுக்கு வழிவிட்டு மனிதநேயத்தைக் காட்டிய நூற்றுக்கணக்கான மக்கள்.. வைரல் வீடியோ! This page contains news relating to various facts and events. The views are generally about current affiars and general topics in diversified areas such as political, international, national, and regional issues, sports, health, travel, lifestyle, technology and business. People having similar interets on the above topics will find this page useful. 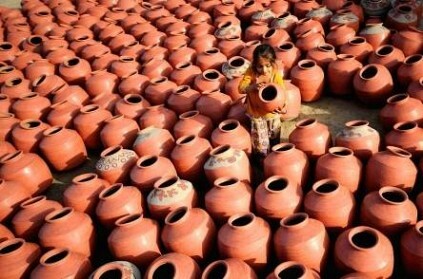 Kerala man distributes 10,000 earthen pots to quench the thirst of bir | India News.